I'm fully aware that some people are not into Halloween to the lengths I am. They enjoy the holiday for the candy, but that's about it. However, when it comes to dressing up, they'd much rather dress a turkey or up an ante; not throw on a costume and pretend to be something they're not. While I can't relate to these types, they are still entitled to feel festive during the holiday season, which is where the old fashioned skulls and all-too-popular vampires come in. Get your True Blood (Twilight, Vampire Diaries, etc.) on with some bloody cool looks! Creating a costume doesn't have to mean painting your face or buying a wig. Take some key elements of your favorite character and put them together for a unique look. For instance, when I think of vampires, I think of blood, the color red, teeth and capes. Capes are a must-have for fall and winter; the teeth necklace is gothic and fun, while red distinguishes the entire look. And I love turbans, so I threw one in for good measure. Anyway, I created this look with a Haunted House in mind. Imagine getting geared up to hit your town's Haunted Hayride or Halloween theme park. You'll be warm, you'll be festive, and you'll be scared out of your mind. Good times! Luckily, a lot of these items are from my favorite designers and outlets. Also, Lauren Moshi has a bunch of intricate skull garments on her site. 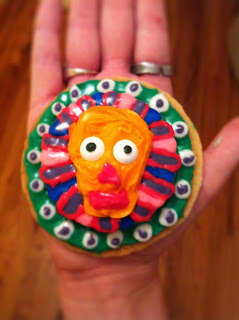 And just for kicks, here is one of the sugar cookies I created for the office! "Dia de los Muertos"